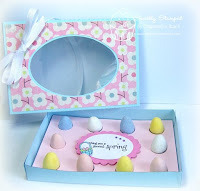 During the sneak peeks, you may have seen the egg box I made for a dozen Cadbury Mini Eggs. Well, Taylor asked if I thought the Taylored Expressions Window Favor Boxes would work for an egg box, and they work perfectly! 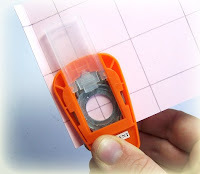 As a matter of fact, it makes it MUCH easier because you don't have to fuss with measuring and cutting the box! 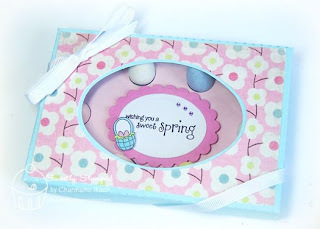 All you have to know is how to create the egg insert! The 3 1/2" side - 1/2", 1 3/4" and 3"
3. 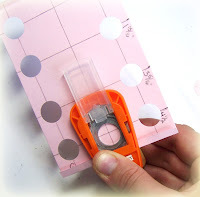 Now center your 5/8" circle punch at the intersections of the measured lines you drew and punch out your circles. 4. For the two middle, end circles, fold the 1/4" scored end before punching to enable the punch to reach. 5. 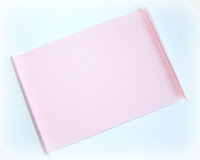 Double stack dimensional tape on the underside of your insert. This helps to keep the center from "drooping" and keeps the insert in place. 6. Place insert into box. 7. Add eggs and embellish center as desired. 8. Embellish outside of box, add some acetate to the inside of the window and tie with ribbon! I hope this helped you to create a simple and quick little Easter treat! That is adorable! So easy too! Thanks Charmaine! You're so clever Charmaine!!! What a fabulous project! Super cute project! Love the bright and fresh colors and cute images. TFS! Adorable, Charmaine! Thanks for the tutorial! So sweet and charming Charmaine!! Oh my gosh Charmaine! You are brilliant! Love this idea...so stinkin' cute! This is soooo cute Charmaine! I loved it the first time and now I am in love and awe! You make it look so easy - so amazed how you transformed some paper in to art!! So sweet with the pastel colored eggs. tfs the project. totally awesome now if I could just find the eggs!! This blog rocks. How AWESOME Charmaine!! I am going to make one of these tonight! Thanks for a FAB tutorial! !